* What is action research and how can it best be understood? * How can practitioners use action research to deal with problems and improve services? * What are the different types of action research and which might be most appropriate for use in a particular setting?This book has been designed for use as a core text on research methods courses at undergraduate and postgraduate level and on professional training courses. It is divided into three parts. Part one traces the history of action research and shows the links between its use in education, community development, management research and nursing. Building on this background the book explores different ways in which action research has been defined and proposes four different types, each appropriate to a different problem situation and context. In part two, five case studies of action research are described from the perspective of the researcher, including case studies of success and instructive failure. Part three is designed to enable the reader to find a route through the maze of methods and approaches in action research by the use of such things as self-assessment and mapping exercises, a guide to diary keeping and to evaluation. 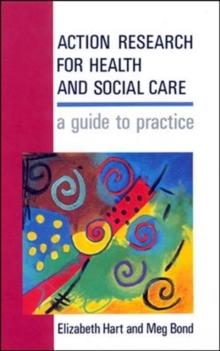 The final chapter suggests that by developing a 'project perspective' action research can be of practical benefit to health and social care professionals in promoting service improvements.